« The labyrinth symbolizes our lives. A Nuit Blanche is a creative moment where one freely walks around. 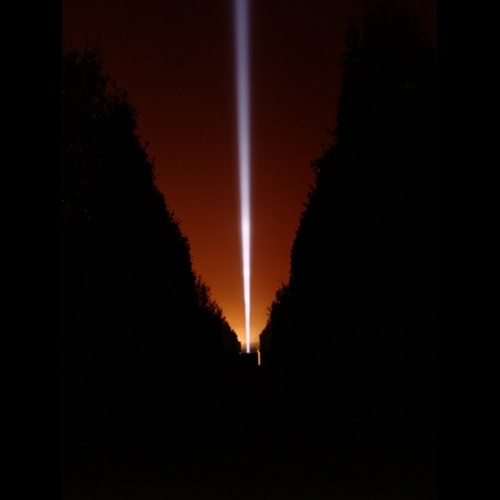 The goal of this installation was to created a mirrored link in between the identical ‘bosquets’ inside which the symbolic spirit of elevation was “drawn” by two vertical light beam directed towards the Sky. In the first labyrinth, mirrors staged numerous reflections like misplaced fixed frames. A narrative voice spoke about intimacy, creativity and abandonment. A moment to reflect on oneself. Sometimes, at random, the magical encounter of both of them (beam and iridescent coated balloon), would cast light in the air, as a newborn star.